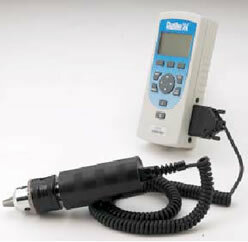 The Chatillon DFS-R-ND Series force gauges supply accurate load and torque measurement in a common gauge. Ideal for hand held or test stand applications, the DFS-R-ND gauge may be equipped with smart loadcells or torque sensors. The auto-recognition feature knows whether a load or torque measurement is required. Measurement accuracy is bettver than 0.25% full scale when used with interchangeable sensors. Accuracy is better than 0.1% full scale when specified with a dedicated SCL load sensor. 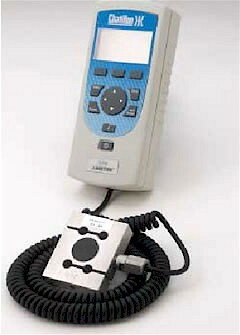 A large, easy to read, high resolution dot matrix LCD display supports a variety of standard gauge functions, including normal and peak readings, high / low limits, setpoints, pass / fail results, statistical results, load averaging, load comparisons, percentage and sharp break detection, sensor actuation and direction. Measurements are displayed in ounce, gram, pound, kilogram or Newton units or in oz-in, g-cm, lb-in, N-cm and N-m units. The Chatillon DFS-R-ND force gauge comes standard with an RS-232 cable, carrying case, battery adapter / charger, and NIST Certificate of Calibration with data.